Holding a dumbbell in each hand, sit on a bench inclined at 45 to 60 degrees. Raise the dumbbells vertically and hold them using a neutral grip (palms facing each other). 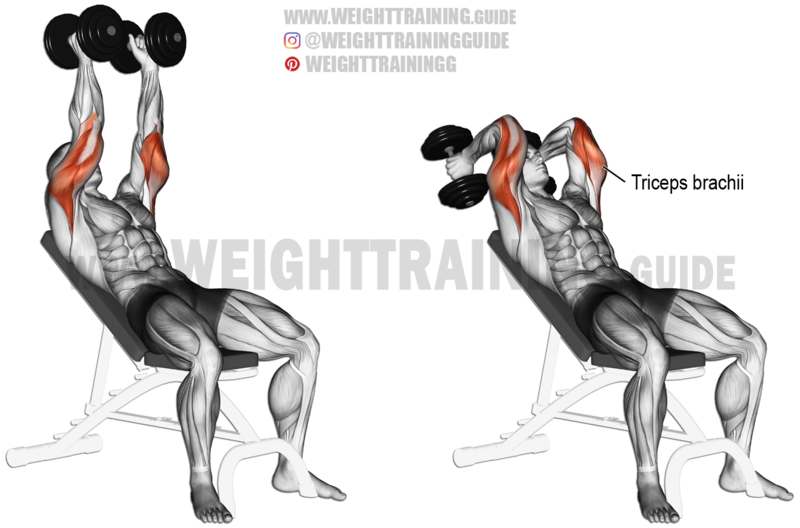 Keeping your upper arms fixed, inhale as you lower the dumbbells behind your head by flexing your elbows. Exhale as you push the dumbbells back up to the starting position by extending your elbows. Ideally, your upper arms should not be vertical but slanted backwards a little. This will ensure that pressure is kept on your triceps brachii throughout the range of motion. Adjust the angle of the bench accordingly. Keep your upper arms fixed, with your elbows close to your head. Only your forearms should move. The more your elbows move away from your head, the more likely your deltoids will get involved. See also the incline cable triceps extension and the decline dumbbell triceps extension. Great site you have here! Very helpful. How many triceps exercises! Is this the best one?